I want us to think this morning about a Sunday 73 years ago. Most of us probably can’t remember it, but I reckon a few of you might have some memories of the year 1945. Interestingly enough, Easter fell on the same day in 1945 as it did this year: April 1. It was a momentous year, because our nation had been involved in a huge war on two fronts. And in April of that year, people were feeling that the war in the Pacific was going to be won, and that the war in Europe was as good as over. Nobody in this country was left untouched by the war. It seemed that just about every family had somebody who’d served, and many had had a family member killed or wounded in action. But by Easter Sunday, people were filled with hope for the future. People in this country, that is. War isn’t one-sided, however, and if one side was poised to be the victor, another was about to lose. And Germany wasn’t just losing. It was being devastated. As hopeful as Americans might’ve felt, Germans must’ve felt completely hopeless. 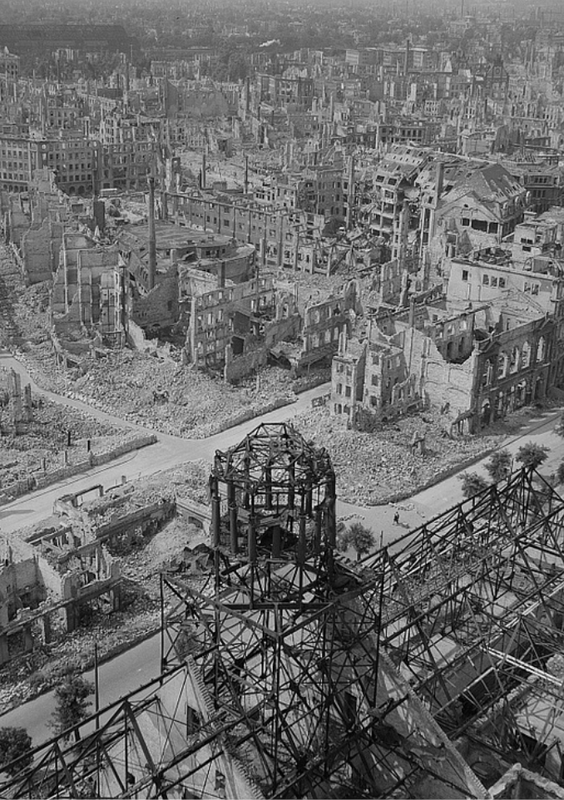 To them, April 1945 looked and felt like the end of the world. The nation was in ruins, and its vile leadership was hiding in bunkers in and around Berlin. Everything they’d been told to believe in had turned out to be a lie. Worse yet, many Germans were now discovering that their efforts on behalf of their beloved homeland had resulted in the enslavement, torture, and mass murder of millions of innocent people. As the early springtime sun rose over the empty shell that was once a great country, many hearts which were already broken must’ve found little hope to celebrate the resurrection on April 1. They were surrounded by a kind of perpetual Good Friday, and their religion had years before given up any hope of resurrection. You see, the official Protestant church of Germany had handed over its soul to the Nazis soon after they came to power. Calling themselves German Christians, they adopted the national Socialist platform as their own, denying the Jewish roots of their faith, condemning tolerance as weak and contrary to Gospel, and putting their highest faith in their own political leaders. 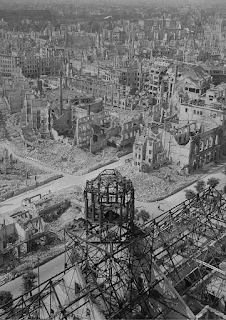 By the end of the war, German Christian doctrines had been exposed as lies, embodied in the smoldering ruins in which the church buildings themselves lay. So how can Easter speak to a people who had denied so much of the gospel? For one German in particular, Easter 1945 really must have seemed like the end of the world. Or at least it was the end of this world. His name was Dietrich Bonhoeffer, and he was a German pastor who’d early on seen the truth behind the Nazi agenda. He had spent nearly his entire adult life exposing and convincing others of its dangers, and resisting it in almost any way he could. He was a Berliner from a well-to-do family, and when the Evangelical Church of the Prussian Union—his church—adopted the doctrines of the German Christians, he took his stand with and among those who refused to capitulate. They called themselves the Confessing Church, and published a declaration, adopted in the city of Barmen in 1934, which formalized their opposition to the German Christians. Since the educational institutions were now in the hands of the Nazis, Dietrich Bonhoeffer was entrusted with training young pastors for the Confessing Church. He established a seminary in the Pomeranian village of Finkenwalde—now in Poland—which I might translate as Finchwood. The school lasted three years until the government finally forced its closure. Bonhoeffer was then banned from teaching, publishing, or even preaching. He somehow got a job in intelligence, however, and from there he used his position to help Jews escape and to help plan the Nazis’ demise. He was finally arrested in 1943 and accused of helping plan an attempt on Hitler’s life. He spent the rest of his life in prison, most of that time in Berlin. A song we’ll sing a bit later in the service, in fact, was originally a poem written by Bonhoeffer for the New Year 1945. As the end of the war drew closer, however, the S.S. didn’t relent in their efforts to prove their case against him. When they finally had enough evidence to move him to a concentration camp, they needed to move him from place to place in order to keep the allies from liberating him. I’ve chosen to talk about Bonhoeffer this morning because I think his life and death help all of us to put this holy season in context. And even though it’s the Second Sunday of Easter, I’m thinking about Palm Sunday in particular because both Bonhoeffer’s life and something that specifically happened that day in 1945 can help us better understand how his life glorified the God whom he lived and died for. So let’s think first about Jesus, who entered Jerusalem to the cheers of the people. They waved palm branches in welcome, and lay their cloaks in his pathway. They shouted Hosanna to the King! (and remember, the Hebrew word hosanna is a plea for salvation). And this all happened on Sunday. By Friday, the same adoring crowds had been manipulated into shouting Crucify him! And so he was put to death for crimes he never committed. (Did you note the irony? The one of whom they were requesting salvation on Sunday would be the very one to whom they denied salvation on Friday.) None of this changes the fact that the Palm Sunday crowds were originally right: Jesus was the saving King—just not the kind of king they wanted. Palm Sunday showed us that a superficial reading of any current situation cannot always be trusted, and that following a crowd is often a shallow thing to do. It might’ve helped if they’d truly thought about the prophecy they supposed Jesus was fulfilling when he entered Jerusalem in the first place. The prophet Zechariah predicted that those who had conquered Israel would be defeated, and that a new kind of peace would be ushered in. The prince of this peace, though great enough to defeat the powerful, was lowly enough to identify with the weak. The Palm Sunday crowds in Jesus’ day only appreciated part of this passage. They rejoiced to see the prophecy fulfilled, but the nature of the prophecy itself seemed to escape their understanding. Apparently they thought the fact that Jesus was riding a donkey was just a prop. But both the prophecy and the very life of Jesus make it clear that humility was at least as important as victory in the life of Messiah. Jesus wasn’t just pretending to identify with the meek in order to make Zechariah’s words appear to come true. Jesus rode a donkey because he truly was humble. He wasn’t doing what he did to fulfill prophecy; prophecy was written because that’s what Jesus was going to actually do. But by Good Friday, the crowd been exposed. They didn’t want humility; they wanted strength. They didn’t want God-with-us; they wanted a leader-over-us. So let’s turn once again to Bonhoeffer. He celebrated his last Holy Week in the most horrible conditions imaginable, being moved from one concentration camp to another. And on April 8, exactly 73 years ago today, he as a pastor was asked by some of his fellow prisoners to conduct Sunday worship. He refused. He felt that presiding over worship would’ve been divisive, since he was a Protestant and most of his fellow prisoners were Roman Catholic. Moreover, one of his closest friends in the group was an atheist. He would do nothing that might exclude others. However, the rest of them—Protestant, Catholic, and atheist—prevailed upon him to conduct the service, and so he did. Please note that Dietrich would not allow Jesus Christ to be the reason that anyone be excluded from the community, or that the community might be divided in the Name of Christ. He was more willing to keep his beliefs to himself than to let those beliefs stand in the way of life together. Clearly he was not fearful of what others might think. He had, after all, been imprisoned for his principles and was getting ready to be executed because of his beliefs. And on April 9, 1945, that’s exactly what happened. 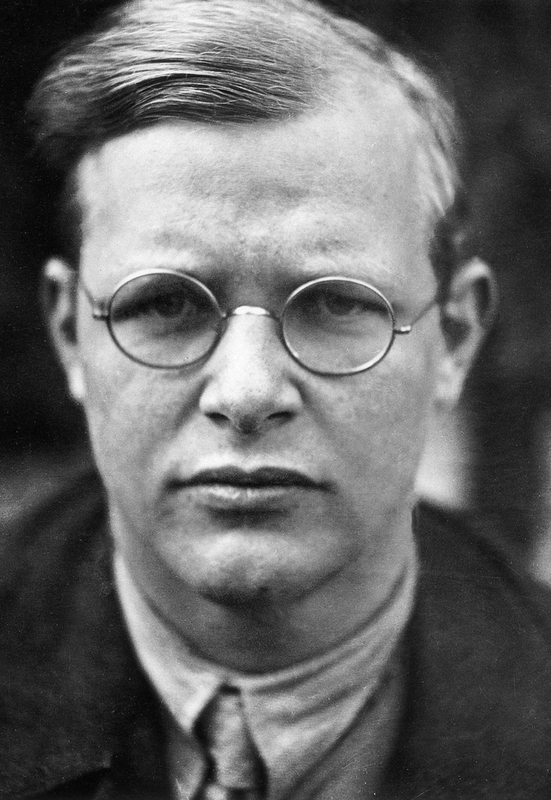 Bonhoeffer was hanged for treason against the Führer—a man who had forced upon the Christian church the belief that humility was weakness, that diversity was repugnant, and that following a human leader was to be desired more than faithfulness to the gospel. It seems impossible for us to imagine, I know. We live in a nation where it’s not possible that what happened in Germany in 1933 could happen here. Our constitution protects us from an unhinged megalomaniac who received a minority of votes actually being installed as leader. We cannot imagine people in this country ever being rounded up and deported. And certainly if this ever happened, the Christian church would not be fooled into supporting such a leader and such inhumane policies. But it happened once before in a land far away, so we must be wary, even here, even now. Christ must be our true light, and the faith of saints like Dietrich Bonhoeffer might well help guide us toward that light. For him, faith in Christ was deep enough that he did not need to force it on others or to display it as though it were a sideshow. By the end of his life, Bonhoeffer is famous for having begun to think about an idea he called religion-less Christianity, because for him, faith was not a religion, faith was life. And he found it much more authentic to actually live a religion than to simply practice it. How different would our nation and our world be if more people shared not only Dietrich’s courage, but also his depth of faith? So let’s think during this morning’s prayer time about the ways we allow Christ to divide rather than unite; the ways we prefer proud human leadership to the gentle meekness of Jesus; and the ways we fear the disapproval of the crowd more than maintaining the integrity of a true disciple. We’ve had two weeks now to consider that Palm Sunday crowd—the first one—that cried for salvation from a triumphant Messiah, but refused him grace on Good Friday. If we are truly Easter people, then let us remember that the glory of resurrection only came about after the humility of the donkey and the humiliation of the cross.